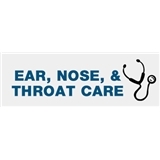 Ear Nose & Throat Care, a Professional Association (Dallas) - Book Appointment Online! Dr. West received his bachelor's degree from the University of Pittsburgh and his medical degree from Chicago College of Osteopathic Medicine. Dr. West was an intern at Tripler Army Hospital and completed his residency in ENT at Tulsa Regional Medical Center. Dr. West is board certified and has been in practice since 1989. He is fully committed to each and every one of his patients. I was in and out of the office in less than an hour, was very thoroughly examined and had a diagnosis, explanation and treatment plan that all made very good sense to me. She asked that I follow up to make sure I am feeling better and that her abnormal findings are resolving.